The firm has an Android app similar to its new iOS app under construction. Asana is mostly known for its Web product, which is designed to lower email flow inside of groups. Asana told TechCrunch that hundreds of thousands of teams use its product. That vague guidance was preceded by notes from the company earlier this year that tens of thousands of teams used its service. Asana has free and paid tiers, charging from $50 to $800 per month or more depending on how many seats a group needs. I spoke with the company and played with its new iOS application. Its earlier tool, the company said, was more a companion app than a full-featured experience. The new app is designed to be sufficiently robust to handle full use of Asana. 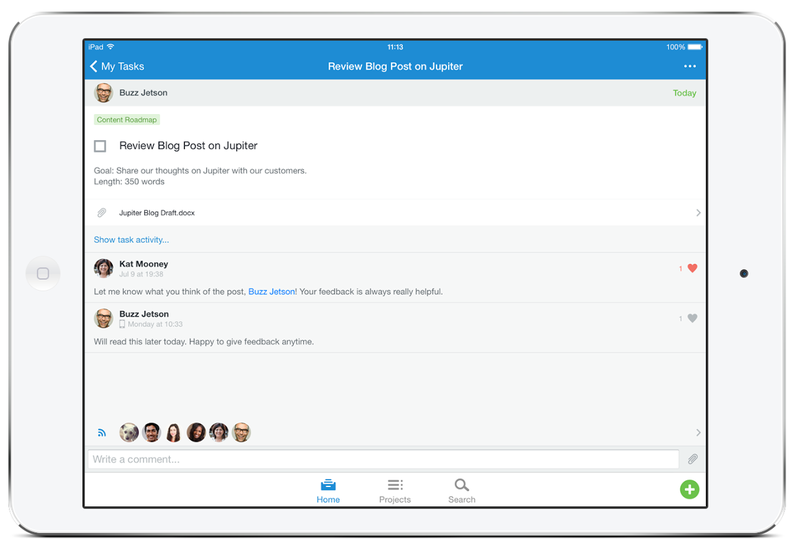 That capability may open Asana up to new, mobile-first customers. Aside from iOS — and Android shortly — the company has no current intention to build apps for other platforms, leaving Windows Phone and BlackBerry on the outside. Asana told TechCrunch that it has seen faster growth in the first half of 2014 than earlier periods. I asked if the company was looking to raise new capital — Asana indicated that it has no short-term plans to pick up new investment. Its last funding round totaled $28 million in July of 2012. The company’s staff has grown from around 55 in January to more than 80 today. Its staffing growth, past capital timing, and lack of immediate plans to secure external cash implies that the company’s revenues are expanding in line with its expenses. That makes it almost an outlier in the business-to-business SaaS space. A better iOS app was the company’s No. 1 request from customers, Asana told TechCrunch. Asana is echoing Facebook in changing directions by building native-code mobile apps, and Yahoo, in switching its focus to a more mobile-specific bent. The change to a multi-platform strategy that has mobile as an equal player to web isn’t too surprising — the enterprise itself is going mobile, and therefore to see Asana following the trend is reasonable. Asana didn’t have specific guidance for the timing of the release of its Android application. The company’s new iOS app has normal Asana features like task management, search, and calendar capabilities. It also includes a green-colored button that allows quick task making, or taking a note. The app itself sports what the firm called a new “design language” that is more vibrant than what preceded it. That language will, over time, leak into Asana’s web product. In its current form it contains small effects like a heart-based animation and colorful tags. Now live, it will be interesting to see what response the new app picks up from users, and how high it can chart. Strong reviews and ranking will imply success, while less pulsing indicators will point to market apathy. We’ll see.